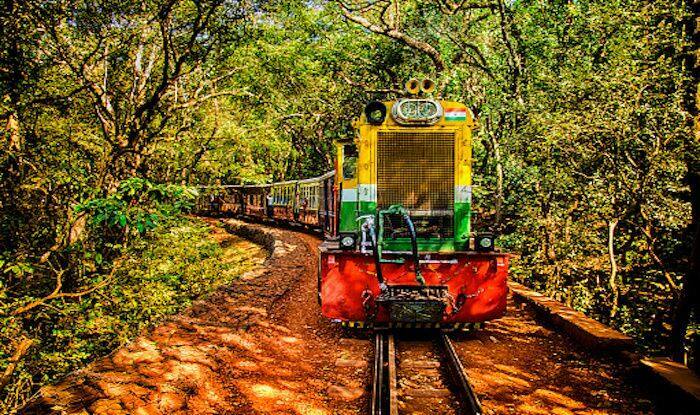 For those who like a touch of luxe to the ordinary, you can now rent an entire toy train to Matheran. The stunning hill station at the edge of the hills on the Western Ghats makes for a delightful getaway, but to be able to do that on a toy train from Neral, will be a whole new experience in itself. Be it a pre-wedding party, or a really special occasion that you’re looking to celebrate with only a close few in a unique way, then this is worth a shot. You can rent the toy train for a lakh; starting the journey early morning and returning the same evening. The train with its four coaches can accommodate 100 passengers. Each side will be close to a 3 hour ride; and since the speed is limited to 12km/hr, it means the passengers will get ample time to soak in the beauty of the picturesque valley. The plan is being put together in order to promote hill rail tourism in Maharashtra. The rail service in Matheran started back in 1907, and definitely has some historic significance. Since it’s a non motorable hill station, it’s likely for the toy train service to actually pick up. Interestingly, Matheran Railway has also been nominated for the UNESCO World Heritage site and who knows it might go on to win the revered title. The train runs along the Neral – Matheran route, up the narrow, snaking charming hillsides. It covers a total distance of 21km, traversing lush forests of Matheran. This ride is a source of pride and joy of this charming hill station that has a diverse range of flora and fauna as well. Take a train from CST to Khopoli or Karjat station. Get off at Neral, get over to the other side of the station and then take the toy train to Matheran station.